Ever stayed at a hotel and, over your buffet breakfast the next morning, cast longing glances in the direction of the tall, lovely jars used to serve orange juice? Thanks to the Collins Beverage Jar from Anchor, you can turn your own dining room into a luxury hotel in a jiffy. And the best thing is, you get to decide what’s on the menu! 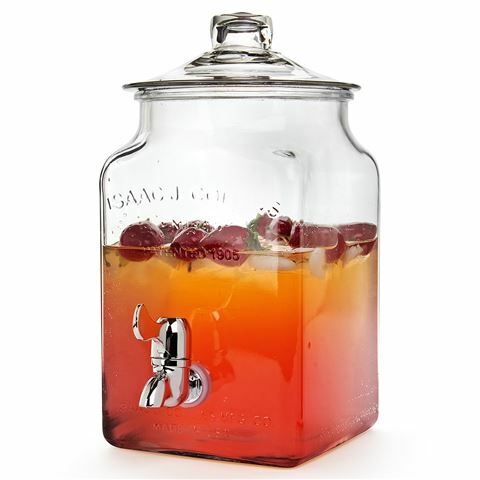 Perfect for parties (or just an interesting way to get a few glasses of water every day), the Collins Beverage Jar has a solid glass body is fitted with a spigot for a neat and tidy pour, while the wide lid makes it easy to add ingredients such as fruit, a mix of juices, and plenty of ice. From DIY buffet breakfasts to parties and so much more, this beverage jar is a dream come true. Crafted from heavy-duty glass, with a chrome spigot. Square shape, with raised Isaac J. Collins logo on the front. Simply turn the tap to fill your glass. Removable lid at the top of the Beverage Jar allows for easy refilling. Dimensions: 16cm (w) x 33cm (h) x 22cm (d) (including lid and spigot tap).